WSOP.com to Sponsor New Jersey Online Poker! Online poker is officially going in New Jersey, and to celebrate the World Series of Poker is holding the WSOP.com New Jersey Online Championships Tournament Series, which will consist of nine tournaments and culminate with the $250,000 WSOP.com Online Championship Freeroll. That freeroll will be open to everyone who played in any one of the previous eight tournaments. The post includes a schedule of the tournaments held mid-January through early February, and contains information and links to get you registered for the $250,000 Freeroll on January 19, 2014. Mark your calendars for February 8! You won’t want to miss this reunion of the 2010 WSOP Final Table players. For the first time in recent memory, the members of the World Series of Poker (WSOP) November Nine will reunite under one roof at the Foxwoods Mega Stack Challenge on February 8th. The gathering will take the form of a three-table, 27-man tournament featuring Foxwoods qualifiers and members of the 2010 WSOP November Nine. When I was in Las Vegas for the final table, the November Niners roamed the reception area/ television area at the Rio and were freely accessible to shake hands with and congratulate. I made sure that I shook hands with Joseph Cheong who played with wisdom beyond his years. If you haven’t had the chance to meet a November Niner up close and personal, this will be a great opportunity. This adds an exciting new twist to becoming a November Niner! Eastern Poker Tour $30K Tournament? Did the Eastern Poker Tour’s $30K tournament scheduled for August 2010 ever get completed? The no limit hold’em tournament started November 13th and 14th. They played down to 26. November 20th, I spoke with one of the finalists. 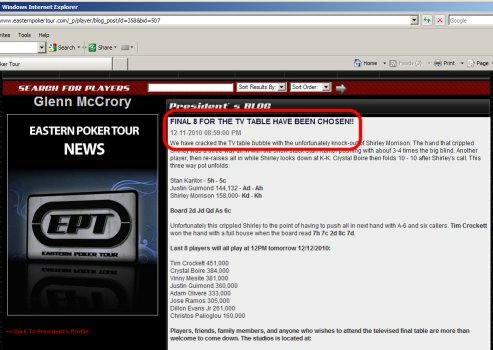 A totally psyched, pro-Eastern Poker Tour player was looking forward to playing at one of the final three *televised* tables scheduled for the weekend of Dec. 11, 2010. Play was suppose to have resumed the next day to televise the final table. Even though the no limit hold’em tournament had been cancelled, I showed up to see how the Eastern Poker Tour would handle “the morning of”. A friend in the travel business had told me that when large events got cancelled at the last minute, the sponsor of the event would send representatives to the venue at the scheduled time of the event in case registrants were unaware of the cancellation. The sponsors would be there with time-of-the-day appropriate drinks and goodies – and – profuse apologies. You know, those drippy, sickening sweet kind of apologies. The ones that make you think that maybe they do care. Maybe there was a last minute glitch. So my friend encouraged me to go see how the Eastern Poker Tour was going to handle the cancellation of its $30K No Limit Hold’Em Tournament. When I turned into the driveway, I stopped to take this picture. No people around. No signs to let me know the event had been cancelled. Just beautifully manicured grounds and quiet…a lot of birds and early morning sounds. Okaaaaayyy. The Chief of Police. So that was unexpected, and, my brain spent some time trying to process it. No reps from the Country Club. No reps from the Eastern Poker Tour. No coffee. No donuts. No aplogies at any level. Instead, a police presence. Why did the Chief feel compelled to be there? What kind of trouble was he expecting? And why was he expecting trouble? The short story is that we spent the next 45 minutes talking. Mostly about the process an organization like the Eastern Poker Tour has to go through to hold a No Limit Hold’Em tournament in the town of Pembroke. The weekend prior to this scheduled no limit hold’em poker tournament, I had driven to the Pembroke Country Club to scope out the layout, the parking facilities in order to come up with a plan for getting to and from the hotel, etc. 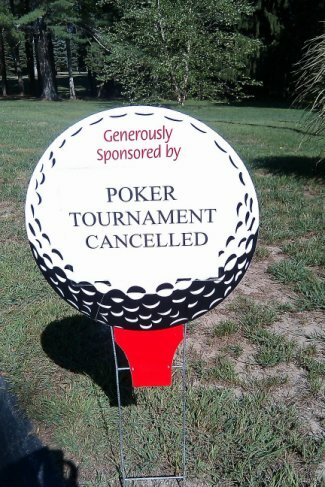 On that Saturday, three Country Club employees told me that the Eastern Poker Tour event was not going to be held there. The next night, I mentioned this to the franchise owner of the tournament I played. He said that he had heard differently and that he would confirm. The next night, he told me that he had checked on the information that I was told, and he was told that there was no truth to it. Okay, we move on. The No Limit Hold’Em tournament will be held at the Pembroke Country Club. Of course during that conversation we talked about our individual experiences with the Eastern Poker Tour. It was interesting to compare what I was seeing (being told) as a player with the Chief’s perspective of what was going on at the same time. If you have 220 players and 50 get into the tournament by winning the satellites, that’s 170 paying players. 170 times $120 = $20,400. If you pay the charity $4,000 – $5,000, that leaves $15,400 – $16,400 to pay salaries for the day…and the rest is profit. (I’m assuming the rent for the venues is comp’d which is standard operating procedure for charity events.) Hummmm. Food for thought. While we were talking, about 7 – 10 other vehicles arrived with players. One guy I recognized from the Framingham Tour. He wasn’t so disappointed because his family was having a reunion that weekend, so, he would be able to attend. Another 20-ish looking guy had driven from Conneticut with his mother, girlfriend, and infant in tow. The look of disappointment on all their faces is a visual I won’t forget real soon. They all had obviously been very excited. As I drove down the long and windy driveway to return to my hotel in Rockland, I saw these placed periodically along the side of the driveway. You’ll recall that the Eastern Poker Tour cancelled the $30K Championships at the last minute – 1:22 PM, Friday the 27th – less than 24 hours before the start of the event. I did not get the e-mail until 6 PMish Friday night. I immediately contacted Travelocity and was informed that the hotel reservations I had in Rockland, MA were non-refundable. The Travelocity customer service person was happy to “reschedule”, but, I would still be charged in full for the weekend of the 28th and 29th. After all, it was already past check in time (4:00 pm) for the first night. I asked what the charge would be to cancel the reservations all together and was told that the cancellation fee would be the “full charge” for the room for the two nights. Okay, so then I thought that if I connected with someone at the front desk of the hotel, I would be able to reschedule the reservations, convert the reservations to another hotel in the area, receive a credit to be used within the hotel chain, etc. Well, I couldn’t get to the front desk. I called the 800 number on the website and was told by the customer service person that because I had made the reservations via a third party and not directly with the hotel chain, that they could not help me. They did not have access to my records, etc. and I would have to deal with the third party. And…what were all the other players doing? Okay, so now I’m not playing in the no limit hold’em tournaments that I had worked so hard to qualify for since February, AND, I have reservations for the weekend at a hotel in Rockland, MA. Ticked off and left high and dry for plans for the weekend, I finished my laundry, packed my bag and headed to Rockland! WTF was I going to do? Friday afternoon, I rushed home from York Beach Maine in order to do a laundry, and then go to the hotel I had reserved in Rockland MA for Friday and Saturday nights. I reserved a hotel room so that I would be fresh and awake for the long, all-day sessions I anticipated for Saturday and Sunday. 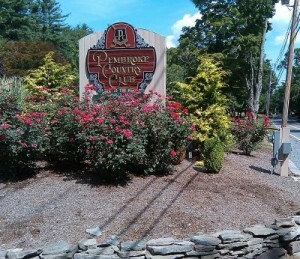 The Pembroke Country Club is about 1.5 hours from my town. My thought was that I had worked hard to give myself every advantage in playing these tournaments. I didn’t want to put myself at a disadvantage by fatiguing myself by getting up extra early or by driving the 1.5 hours back and forth…or getting stuck in the Saturday morning summertime traffic heading toward the Cape…and returning home at who knows what time of day. There was no way of knowing what time we would reach the winning 10 – or – you would bust out. 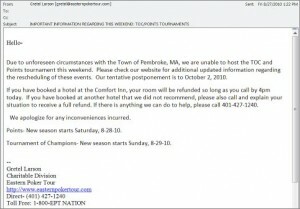 The EPT had e-mailed out and posted (on its website) “stern” rules about arriving on time and registering for the events. I had worked too hard to have any fluke accidents…hence the hotel. While I was waiting for the laundry, I decided to catch up on my e-mails. 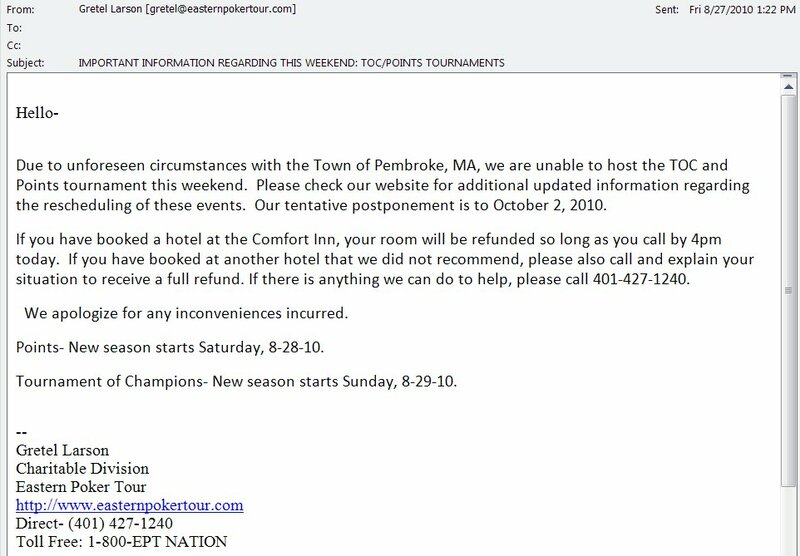 Unbelievably, there was an e-mail from the EPT that had been sent Friday afternoon at 1:22pm announcing the cancellation of the $30K Championships tournament. Please note, this weekend’s event is pushed back to a later date. We will post on the website and email out the details on the future event. NEW SEASON AND NEW POINTS START SUNDAY: ALL PLAYERS WHO QUALIFIED FOR THIS SEASON’S CHAMPIONSHIP WILL REMAIN IN THEIR CURRENT STANDING. Any questions shoot us a phone call (401) 529-4572 or an email. First of all, the subject of the email is SO ambiguous: IMPORTANT INFORMATION REGARDING THIS WEEKEND: TOC/POINTS TOURNAMENTS. If you have ever played in a tournament, you are expecting the Rules & Regulations…and guess what the subjects of those of emails are? “IMPORTANT INFORMATION REAGARDING”… It is highly likely that this email was mistaken by some players for the standard Rules & Regs email and deleted without reading or simply ignored. Second of all, the TIME OF DAY that the e-mail was sent (1:22PM) and the notice was posted on the website (1:48PM) is incredulous to me. 1:22PM and 1:48PM the day before the tournaments are about to start…less than 24 hours before? Who in the world was online on a Friday afternoon in the late Summer? And if they were on line…Who in the world would be able to cancel their hotel reservations in time? I didn’t even get to read the email until after 6:00pm Friday. IF I could have modified my hotel reservations, it was already too late to cancel Friday because the hotel Check In started two hours earlier. How f’in stupid does Glenn think the players are? The donkey that is the Eastern Poker Tour Headquarters surely needs a lesson in how to treat customers. The cowardice demonstrated by McCory in having someone named Gretel – whom I’ve never received an e-mail from before but I think I saw a picture of in one of the highlights – deliver the bad news. (I hope Gretel wakes up some day to understand how she was used in this drama that Glenn created.) 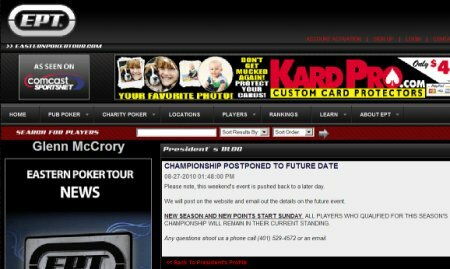 Glenn has his own e-mail and has used it in corresponding in the past (Glenn McCrory [glenn@easternpokertour.com]). One curious thing I have noticed over the last 3 -4 months is that looking at the website, Glenn’s involvement is less and less evident. His contact information has been removed and he is hiding behind his franchise owners and employees. And, where was the Eastern Poker Tour employee or rep Saturday morning? Did the organization send someone to the Pembroke Country Club to greet players and explain? to apologize? Ahhh, that would a “NO”. I was there and no one representing the Eastern Poker Tour was there. I’ll tell you more about what I learned tomorrow… And what about the franchise owners who are the ones who are going to lose from here on out… what do they have to say? If you’ve been following along, you know that I spent the bulk of August thinking, breathing, eating, dreaming, and speaking about the Eastern Poker Tour’s $30K Championships being held the last weekend of the month. I played as much tournament no limit hold em as I could. I told everyone who would listen about the wonderful opportunity I had to play for a spot on the televised final table and the possibility of winning a seat in the 2011 WSOP. The Sunday no limit hold em tournament is for those who have won at least one EPT tournament regardless of region. Those who have won multiple tournaments receive extra chips at the start of Sunday’s tournament. The top ten players from Sunday’s Wins tournament qualify to play in the televised $30K Championship finals. So, 20 poker players advance to the Finals for the $30K Championships. The finals are recorded for TV and shown on Comcast’s SportNet channel. * All in all, not a bad weekend if you can land in the top 10 Saturday or Sunday. There’s no entrance fee for Saturday’s Points or Sunday’s Wins tournaments, so, the only cost to you is gasoline and lodging, and, oh yeah, whatevah you spend for snacks and the lunches and dinners provided by the venue. I had doubled upped on playing until the week of the Championship tournament. That week, I played Sunday and Monday, then took Wednesday, Thursday and Friday off. I even went to York Beach Maine Thursday and Friday to totally relax in the surf and the sun so that I would be fresh and ready to go for long, all-day sessions on Saturday and Sunday. <– I had qualified to play both days. * I understand that 27 players advance to the finals. I believe one of the players advances from the Battle of the Champions (another no limit hold em tournament for Eastern Poker Tour’s uber-winners) and the other 6? Don’t know. 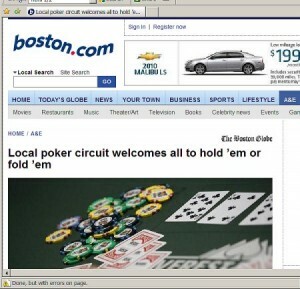 Thursday, the Boston Globe had an article about the Eastern Poker Tour (EPT). Written by Katrina Ballard, the article introduces the Eastern Poker Tour through the eyes of players, tournament hosts, and the owner of the EPT’s newest franchise, the Framingham region. I was pleased to see the EPT get some press, and, since I have been playing the EPT for nearly a year now, I thought I’d comment about some information in the article that doesn’t match my first-hand experience. Maybe she meant to write “real” money as in the “real” (WSOP/WPT) poker money we’ve all become accustomed to hearing about. Maybe not. I have played in the Framingham region ½ dozen times and each time I placed, I got paid in cash or a $30 voucher. Central Mass and Southern Mass regions both pay out. (The other established franchises may as well, but, I have not played them.) Payout is not a ton of money, but, you recover your $15 buffet fee…and then some. Having placed in the top 3-4 of the Central Mass franchise several times over the past year, I have taken home $100, $75, and $50 in cash prizes, one or more times, and, a couple of $30 vouchers for free entrance into satelite no limit hold em tournaments that get you into the charity no limit hold em tournaments that the EPT holds just about every weekend. I live 1 mile from one of the Framingham region’s venues and instead of playing there, I drive 18 miles to play at a venue in the Central Mass region. Why? because I know that the tournament will be well run. One night while playing a tournament in the Framingham region, I watched as the tournament director talked for 2+ minutes while shuffling cards at the final table. The play was down to 3 and one of the players was severly short stacked. The director burned up 2+ minutes of the short stacked’s time to improve. In that time, two or three hands could have been played…and the short stack could have earned some chips. There were other hands at the final table that night where the tournament director talked and talked – not quite reaching the two minute mark…but still, totally oblivious to the clock. In contrast, at the Central Mass tournaments, all players are very sensitive to the blind time. Even when players are self dealing, the next hand is being dealt while the winner of the last hand is raking in the chips. At the final table, a second deck is being shuffled while the franchise owner deals and manages the current hand. When the hand is complete, the second deck is being dealt and the first is being shuffled. How can you experience a bad beat in a no limit hold’em tournament before it starts? MY experience today has taught me…By choosing an Eastern Poker Tour no limit hold’em tournament and by not standing in the exact spot you were suppose to be standing in – even though no one told you where to stand. So, I planned my whole day around playing in an Eastern Poker Tour charity event tonight. Whole Day? Yeah – The plan was to win a seat into the 6:00pm charity event by playing in one of the satellites (two if I had to) that started at 2:00pm. Announcement of the Charity Tournament for today on the Eastern Poker Tour's website. I arrived at the venue at 2:20. Walked right to Eastern Poker Tour’s desk and signed up for the next satellite table. I told the two women at the table that I was going to the bathoom. I did that and came back to the desk and the guy running it, Nicholas Faucher, was there beside the two women. I went to go into the poker area. It was so much hotter in there – like 8 degrees hotter than in the hallway – that I came back out and took a seat across from Eastern Poker Tour’s desk. Then I waited and waited and waited. Finally, after 45 minutes, I got up and checked how many spaces were needed to be filled in on the satellite table list and there were 2 left. So I watched every person come and go until finally, a tenth person signed it. I got up and walked over toward the poker area. As I entered the room, I heard Nicholas say, “Everyone waiting for table 3 come up front here [where the table was].” Some players were already at the table. There was no chair in the seat that I wanted so I went and found one and dragged it over. Then another player was trying to fit at the table and no one had left room because they just sat down where there were seats. So that player went and shagged his own chair. I had won a free pass into a satellite game [of my choosing] in early May. I placed the pass in front of my seat. Nicholas took the pass of the player to my left and processed that first. Then he takes mine and says [with an arrogant swag of the head and an attitude], “I need some ID over here.” So, I retrieve my license and hand it over to him. He checks it out, then the list, then tosses the pass back towards my seat and says [with even more disgust than when he requested my ID], ‘You are not on the list.” I respond, “What do you mean I’m not on the list. I signed it an hour. Where’d my name go?” I look at the list he is using and indeed my name is not on it. He said, “You were on that list.” as he points to a nearby table . So, I said, “What? I’ve been waiting for an hour. Why didn’t you call me?” He just ignores me and goes on processing the rest of the table. Nicholas gets that table settled, comes out and I ask for an explanation about what happened. He told me “I waited TEN minutes for you.” [Okay, so, now we know he’s an outright liar. No one waits ten minutes in poker.] I told him, “That’s just not true. It doesn’t take ten minutes to walk across the floor and go to the bathroom and come back.” Nicholas said, he had looked for me every where…Waited several minutes…[Oh, so NOW the story changes. 30 seconds ago, he waited TEN minutes for me.] Even gone into the bar looking for me… Derrr, I was sitting right next to the desk near the entrance. I told him where I had been sitting and that I had been there for an hour. And he gives me that arrogant swag of the head again and says, ” Hey if you are not there when the table is called, you get bumped to the next list.” So, I responded, “but, you didn’t bump me to the next list.” Nick, “I thought you left.” Then he says, “What do you want me to do? There are players in there that want to play poker.” <– AM I EVEN SUPPOSE TO UNDERSTAND THAT? That’s why I arrived an hour ago!!!!!!!!!!! Nicholas Faucher was rude and arrogant, and I didn’t deserve his attitude. The bottom line is that I was not standing exactly where he wanted me to stand, and, he bumped me to put someone else in – probably, one of his Rhode Island friends. Well, I say to the Eastern Poker Tour that I am not an F’N mind reader. If you want me to be in a certain spot – I’ll be there – just tell me where. I am so disgusted with Nicholas Faucher’s attitude. I’ve already tweeted about my experience. I’ve vented here. Now, I’m going to share my experience with my family, friends and poker colleagues including my brother – who lives in North Kingstown – and his poker buddies. What are your experiences? Is this typical behavior for regional poker organizations?